The NdFeB-based alloys were invented in 1980s and remain the best-known hard magnetic alloys. In order to reach the optimum magnetic properties, the grains of hard magnetic Nd2Fe14B phase have to be isolated from one another by the (possibly thin) layers of a non-ferromagnetic Nd-rich phase. In this work, we observe that the few-nanometer-thin layers of the Nd-rich phase appear between Nd2Fe14B grains due to the pseudopartial grain boundary (GB) wetting. Namely, some Nd2Fe14B/Nd2Fe14B GBs are not completely wetted by the Nd-rich melt and have the high contact angle with the liquid phase and, nevertheless, contain the 2-4-nm-thin uniform Nd-rich layer. 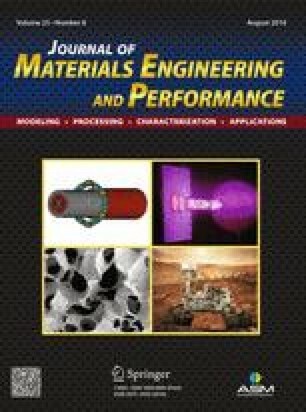 This article is an invited submission to JMEP selected from presentations at the Symposium “Wetting and High-Temperature Capillarity,” belonging to the Topic “Joining and Interfaces” at the European Congress and Exhibition on Advanced Materials and Processes (EUROMAT 2015), held during September 20-24, 2015, in Warsaw, Poland, and has been expanded from the original presentation. This work was performed under the partial financial support of Russian Foundation for Basic Research (Grants 14-42-03621, 15-03-01127, and 15-53-06008), Israeli Ministry of Science, Technology and Space, and Karlsruhe Nano Micro Facility operated by the by the Karlsruhe Institute of Technology.